Military salutes are a fairly standard thing. One comes to the position of attention, raises their right arm outright from the side of the body until it is parallel with the ground and then bends the forearm and hand back until the first finger is touching a point just above the right eye. The arm is then dropped back to the side, resuming the position of attention. Apart from the position of the hand and palm when it is near the head there is very little variation to what is a standard method of paying respect or honor by military and civil bodies globally. Not believing that the generations-old standard military salute was particularly elegant, Thailand’s King Maha Vajiralongkorn Bodindradebayavarangkun last year devised a new salute for his personal guard unit. The new salute commences the same way as a traditional military salute, but once the hand is at the head, a deep breath is taken to throw out the chest, followed by a rapid flick of the head 45 degrees to the left. The maneuver, when translated from Thai to English, literally transcribes as ‘raise you chest and shake your head’. Having watched his own elite bodyguard unit master the new military salute, the King has now ordered it be implemented across all units of the Royal Thai Army (RTA). 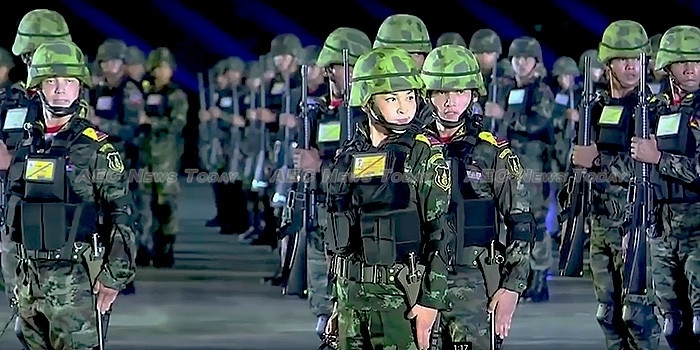 In the video above soldiers practice the the new Thai army salute. Then it is seen being performed by members of the King’s guard unit, who also demonstrate some fancy footwork as well. Finally, members of the Royal Thai Police (RTP) are seen practicing the maneuver, adding a kneel while the hand is held at the side of the head… and discovering that tightly cut men’s trousers don’t afford the same level of freedom to kneel as looser cut military pants in the process. While some of the attempts to master the new military salute in the video are far from elegant — and we have no explanation why the first group of soldiers flick their head to the right and the the others to the left — there is no question that once mastered it adds a certain amount of glamour to what often looks like a gesture aimed at brushing flies away from the face. What do you think?